At 6:01 AM last Wednesday a coach bus rolled out from Met Council headquarters on Water Street in Manhattan on its way to Albany with community leaders who were going to spend the next 15 hours on a mission to Albany advocating on behalf of the poorest members of the community. This was the first ever mission to Albany solely focused on Jewish poverty. 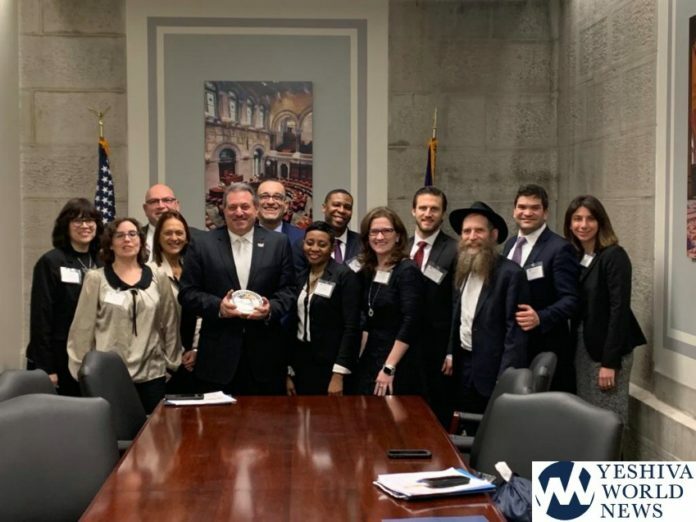 “We went to Albany to highlight that Jewish poverty is a very real problem and to come up with creative solutions to helping the neediest in our community,” said David G. Greenfield, CEO of Met Council. The group of over forty community leaders lobbied the legislature on three significant issues: more kosher food for the poor, additional funding for Holocaust survivors, and advocating for the end of The Benefits Cliff –whereby a small increase in salary can cause a disproportionate loss of government benefits. Met Council arranged meetings with more than thirty legislators representing all five boroughs. The group split into two to lobby as many legislators as they could in their packed day. 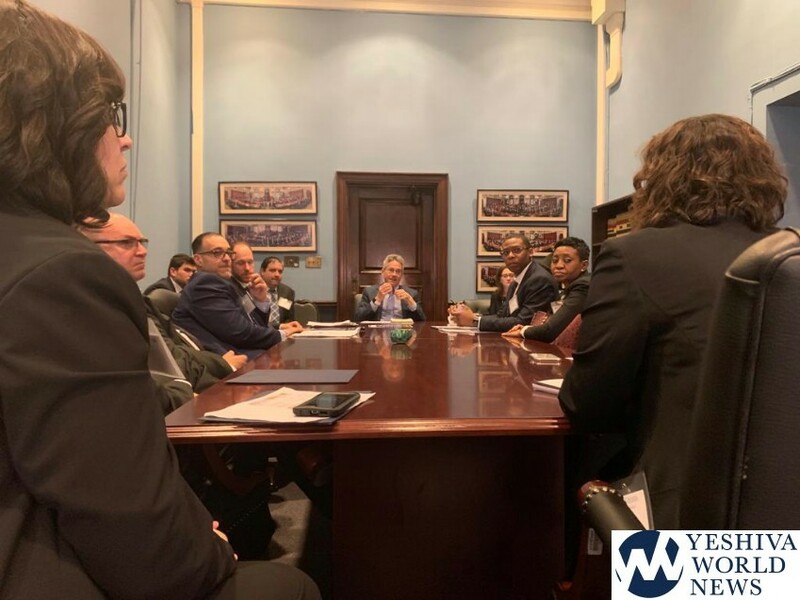 The first group was led by Met Council CEO David Greenfield and the second group was led by Met Council Director of External Affairs Aaron Cyperstein. Both David and Aaron are experts in public policy and advocacy. David was the co-founder of TEACH NYS and a Council Member for eight years before joining the Met Council as CEO and is an expert in government relations and public policy – as well as an adjunct law professor at Brooklyn Law School. Aaron was an Assistant Attorney General and Deputy Borough President of Queens who has decades of experience lobbying on behalf of different organizations. 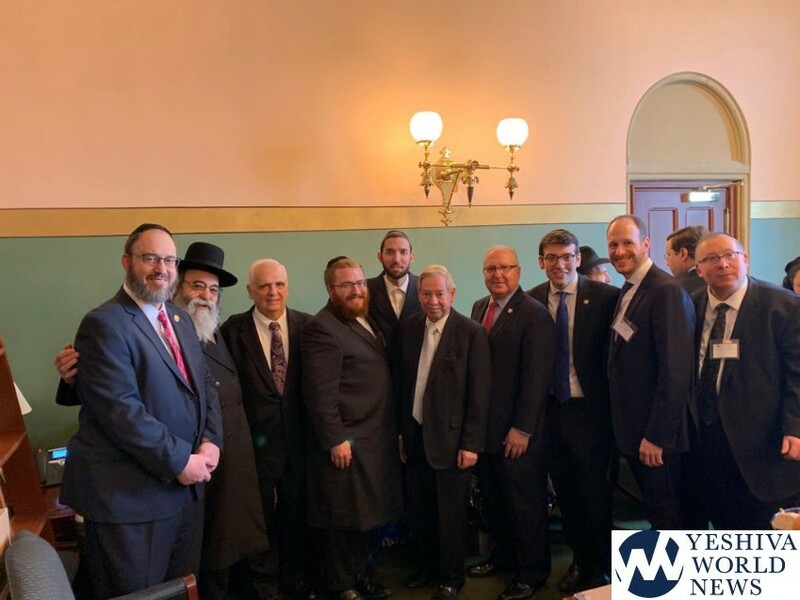 Because of the lack of Kosher food in Albany, Met Council catered lunch by Essen Kosher Deli in Brooklyn that was co-hosted by Assembly Member Steven Cymbrowitz and hosted in the capitol office of Assembly Member Helene Weinstein. Dozens of legislators dropped by to hear about the work of Met Council and their affiliate Jewish Community Councils first hand. 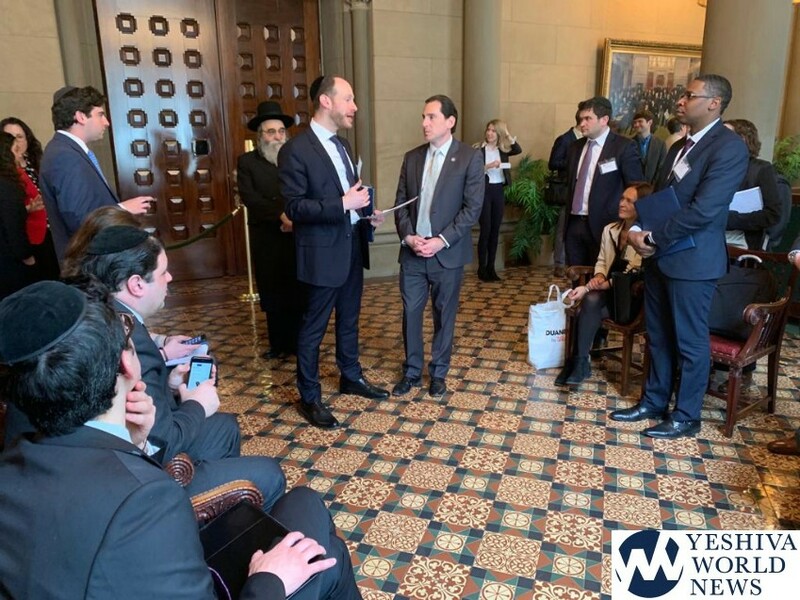 Assemblyman Simcha Eichenstein introduced many legislators to delicacies from his district including hamantashen and rugelach. While munching, they also got to know the leadership of the JCC’s – neighborhood organizations that fight poverty every single day throughout the Jewish community of New York. Representatives from every one of the Met Council’s sixteen affiliated Jewish Community Councils joined the Poverty Advocacy Day including Moshe Brandsdorfer, Jewish Community Council Rockaway Peninsula, Rabbi Eli Cohen, Crown Heights Jewish Community Council, Avi Greenstein, Boro Park Jewish Community Council, Rabbi Avrohom Hecht, Jewish Community Council of Canarsie, Riva Heller, Jewish Community Council of Greater Coney Island, Betsy Jacobson, United Jewish Council of the Lower East Side David Katz, United Jewish Organizations of Williamsburg, Avi Krakauer, Jewish Community Council Marine Park, Rabbi David Niederman, United Jewish Organizations of Williamsburg, Shea Rubenstein, Jewish Community Council Marine Park, Liba Shakhman, Shorefront Jewish Community Council, Brad Silver, Bronx Jewish Community Council, Cynthia Zalisky, Queens Jewish Community Council. Met Council Met with Assemblyman Peter Abbate (Brooklyn), Senator Joseph Addabbo (Queens), Assemblyman Michael Blake (Bronx), Assemblyman David Buchwald (White Plains), Senator Leroy Comrie (Queens), Assemblyman Michael Cusick (Staten Island), Assemblyman Steven Cymbrowitz (Brooklyn), Assemblywoman Maritza Davila (Brooklyn), Assemblywoman Carmen De La Rosa (Manhattan), Assemblyman Simcha Eichenstein (Brooklyn), Senator Simcha Felder (Brooklyn), Assemblywoman Nathalia Fernandez (Bronx), Senator Michael Gianaris (Queens), Assemblyman Richard Gottfried (Manhattan), Senator Andrew Gounardes (Brooklyn) Assemblyman Andrew Hevesi (Queens), Senator Todd Kaminsky (Long Island), Senator Liz Kreuger (Manhattan), Assemblyman Joseph Lentol (Brooklyn), Assemblyman Felix Ortiz (Brooklyn), Senator Roxanne Persaud (Bronx), Assemblywoman Stacey Pheffer Amato (Queens), Assemblywoman Nily Rozic (Queens), Assemblyman Daniel Rosenthal (Queens), Senator Diane Savino (Brooklyn, Staten Island), Senator Toby Ann Stavisky (Queens), Assemblyman Daniel Stec (Essex County), Assemblyman Al Taylor (Manhattan), Howard Vargas, Esq. of Speaker Carl Heastie’s office, and Assemblyman David Weprin (Queens). “If you’re serious about lobbying you go to Albany. That’s why we went – to send a message that we are serious about fighting poverty. I am extremely grateful to our CEO David Greenfield and the leaders of the 16 JCCs for sending a clear message: we have an achrayus (responsibility) to fight for the poorest New Yorkers,” said Aaron Cyperstein, Director of External Affairs, Met Council. Previous articleAgudath Israel Action Alert: Take Action Now To Restore Needed Funding To Our Schools!